Designed for child athletes but strong enough for their parents, the Kids' Pull-up Bar adds a safe, versatile new element to an existing Rogue Infinity rig or 2x3” rack. This 39-inch, 1.25” diameter pull-up bar uses a convenient push-pin system to adjust from ground level up to a height of seven feet. This makes it ideal for the progression of a growing child, or for home gyms and weight rooms utilized by young people of various ages and sizes. Tested at over 500 pounds, the Kids' Pullup Bar is a far safer option for child pull-ups than lifting the kid up to a standard bar or having them stand on a box. A friendly price tag makes it all the more worthwhile for anyone supervising or working with children interested in strength training. This is one of the few American-made children’s pull-up bars on the market. Accept no substitutes. Weight Capacity: Tested at 500 lbs. 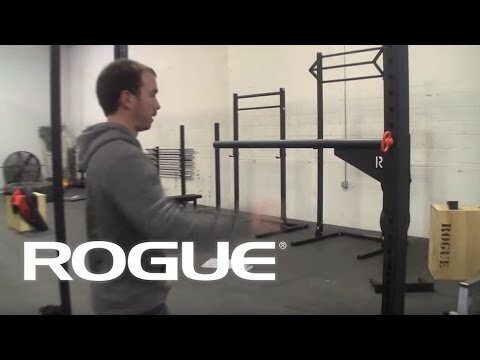 Rogue Infinity Kid's Pull-up Bar is rated 4.6 out of 5 by 9. Rated 5 out of 5 by Another Gym Owner from These are great ! I now have 10 of these in my gyms. They are great for children and great for folks who cannot do unassisted pullups. We are using these to get people to self assist and NOT use a band. Rated 5 out of 5 by Ant1000RR from A lot of Fun My daughter loves using it for pull-ups. Now I have to program in pull-ups just so she can use the bar or otherwise she gets mad. Rated 5 out of 5 by Coach from Kids pull up bar Its a very usefull tool for basic drills in classes. I am happy that i found this.. Rated 5 out of 5 by jas9smith from Awesome - so many uses I love this bar, but I don't use it as a kid's pull up bar at all. To change things up a bit, I started doing a lot of different body weight movements. This bar is perfect for things like straight bar dips, Australian pull ups/chin ups, muscle up negatives, body weight skull crushers, and so much more. I weigh 180 lbs and the thing feels plenty solid to me and I've used it for a lot of different stuff. It does shift a bit if you kip, but for what I'm doing I like it as it keeps me honest and strict on these movements. Rated 5 out of 5 by Brian CrossFitHD from My members love this thing This bar is amazing, especially for my shorter members, folks who need to scale to jumping pull ups, or those working on bar muscle ups. The flexibility that this allows is awesome. It's plenty strong enough to hold most people's weight and eliminates the need to pull out boxes and bands that folks end up using as a crutch and keeps them moving through the workout as intended. Rated 3 out of 5 by jonathandp from Works but could be improved Overall works well. Shakes back and forth. I feel like it needs to be solidified with another pin. Doesn't shake up and down at all. Rated 5 out of 5 by MikeG from Great Addition to the Garage Gym This has been an amazing addition to the garage gym. My 6-year old daughter has been practicing pull-ups and backwards rolls non-stop. It is super easy to set-up and take down. I totally recommend it! Rated 5 out of 5 by vamom from Added peel and stick squares to level bar This is a wonderful kids bar but it doesn't sit flush when connected. I used strategically placed peel and stick felt furniture squares to protect my rig and sure up the bar. Worked like a charm, it is level and awesome. My daughter loves it. I wish they had a 1.5" wood crossmember I could hook up for her as a gymnastics/ballet bar. This one is a bit short but otherwise awesome.